I’m not going to debate that, but I will say Part III looked an awful lot like Part II. Only this time, instead of taking a lopsided unanimous decision victory, Velasquez was able to finish off the Brazilian. Velasquez ate some heavy shots, but continued to power through and grind his way to the winner’s circle. Dos Santos showed the heart of a true champion by continuing to unleash bombs throughout the shootout, though Velasquez’s relentless ways proved too much in the end. Speaking of the end, dos Santos attempted a desperation standing choke in the 5thRound. However, Velasquez easily escaped and dos Santos slammed his own head into the canvas on the way down. Referee Herb Dean stepped in to stop the fight before Velasquez could pounce. The official time came at 3:09 in the final frame. 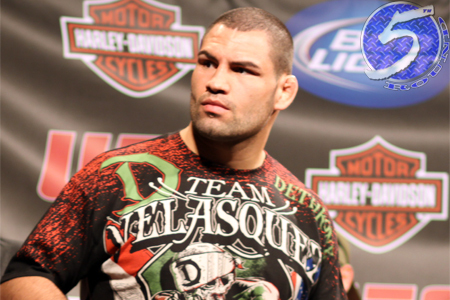 Velasquez now joins UFC Hall of Famer Randy Couture, Andrei Arlovski, Tim Sylvia and Brock Lesnar as the Octagon’s only heavyweight champions to defend the throne two times in a row. According to White, Fabricio Werdum is tentatively up next for Velasquez. UFC 166 took place inside Toyota Center in Houston, Texas.